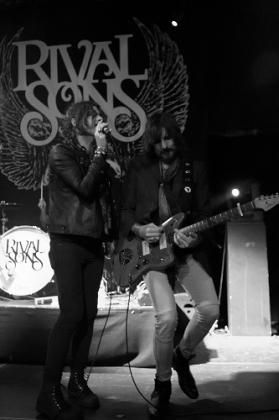 Tonights show was Rival Sons and Heavens Basement. For a midweek gig I was quite surprised to see the venue was busy right from the start - often fans arrive late, but clearly a lot of people wanted to see both the bands tonight. Heavens Basement opened the night and put on a great show which really got the crowd going. We got a very energetic show from the singer who was constantly racing around the stage. At one point early in the set he dived into the crowd and sang there for part of one song before climbing back over the barrier and being dragged back on stage by the roadies. Musically they impressed too - a great choice to start the night. Rival sons were a lot more laid back in comparison and chose to just let the music do the talking for them. Their blues tinged classic rock is great on their album and tonight, live it sounds even better. The large crowd packing the venue clearly agree as the band receive a great reception. "Burn Down Los Angeles" in particular sounds fantastic. This review may be lacking in as much detail as I usually include but thats simply because the bands were so good - I have to confess to not making any notes during Rival Sons as I was just too busy enjoying their music, but that in itself is a pretty good recommendation. Rival Sons are a great band and you should definitely check them out.